Add ancient beauty to your home or patio with the Brown Turkish 26 in. Urn Planter. 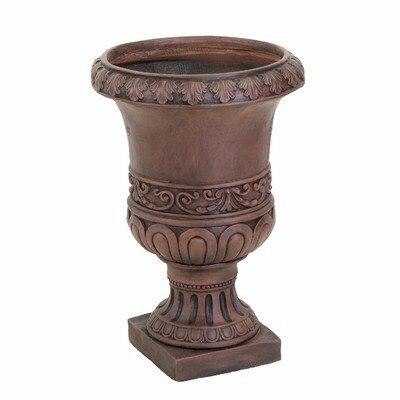 Made from strong and durable stone, this beautiful urn-style planter has a brown finish reminiscent of clay and features intricate Turkish detailing. Able to be used indoors or out, this gorgeous urn is the perfect way to show off your favorite plants and flowers. Compelling modern designs meet classical sensibilities, all at an affordable price - that's how furniture mainstay BEST has remained in the industry for over 20 years. With international and domestic production, BEST supplies a wide range of furniture options. Corporate headquarters in the U.S. oversee sales and manufacturing offices in both Europe and China. Product lines include outdoor PE wicker and cast aluminum pieces, a children's line of chairs and ottomans, and a full line of indoor-living furniture, focusing on storage ottomans, club chairs, and dining chairs. Stressing quality above all else, BEST items are built to last and to be enjoyed by families for years to come. BEST believes the right item should be affordable and can turn a house into a home. Strong and durable stone construction. Gorgeous natural brown finish. Intricate and classic Turkish detailing. Can be used indoors or out. Measures 18.5W x 18.5D x 25.4H in.. Measures 18.5W x 18.5D x 25.4H in. If you have any questions about this product by Best Selling Home, contact us by completing and submitting the form below. If you are looking for a specif part number, please include it with your message.